Keloids are benign fibrous growths that occur after trauma or wounding of skin. Keloidal scars typically extend beyond the original wound and spread by invasion rather than expansion. A large number of treatment modalities have been tried including intralesional steroids, cryosurgery, laser therapy, plastic surgery, radiotherapy, silicone gel, topical therapy (eg. heparin, allantoin, Vitamin A acids, Vitamin E, imiquimod), intralesional interferon α2b or γ, bleomycin, 5 FU. Systemic therapy like pentoxyphylline and physical therapy like ultrasonography, iontophoresis are newer modalities being tried for keloids.,,,,,,, Despite the availability of many treatment modalities for these scars, none has been found to be completely effective and satisfactory. Thus, we undertook the present study to analyse the effect of cryotherapy in keloids and to relate the treatment outcome with the clinico-aetiological factors. A hospital-based interventional study was conducted comprising of 30 patients, more than 12 years of age, with untreated keloids. Patients who had taken treatment for keloids in past 12 weeks and those with contra-indications for cryotherapy were excluded. The clinical characteristics of patients are given in [Table 1]. Baseline assessment was made by taking photographs, palpating for firmness of lesions and measuring the size using Verniers calliper. Patients received cryotherapy at 4 weekly intervals using hand held cryosurgical unit, for a maximum of six sessions or 75% flattening which ever occurred earlier. Adjacent structures were covered using adhesive putty (clay) for protection. Patients were given two freeze thaw cycles of 15 seconds freeze time each using spot freeze technique. In case of larger lesions, the field was divided into overlapping circles of 2 cm each. Each circle was then treated separately, treating not more than 16-8 cm 2 area at a time. Patients were asked to grade the procedural and post procedural pain on a scale of one to ten. Assessment was made one month after 3 treatment sessions and a month after treatment completion. The parameters assessed included size of keloids (measured using Verniers caliper), firmness of keloids, symptomatic improvement and recording using serial photography. Patients assessed the cosmetic appearance and the symptomatology for grading the improvement. At the end of the study, an attempt was made to analyse the effect of cryotherapy in keloids and the various factors affecting the treatment outcome including size, site, duration, and thickness. All the results were analyzed using appropriate statistical methods, i.e., paired Students t-test and Analysis of variance (ANOVA). Thirty patients including 12 males and 18 females were included in the study. A total of 58% patients wanted treatment due to cosmetic botheration, 36% were troubled by pruritus and 6% had pain. Duration of keloids under study ranged from 1-15 years. Thickness of keloids ranged from 0.2-1.6 cm. An average flattening of 30.77% was noted after three treatment sessions with minimum flattening of 0% to a maximum flattening of 80%. 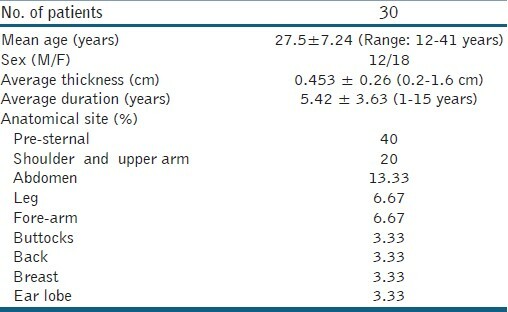 The average thickness of keloids reduced from a baseline of 0.453 cm to 0.325 cm. After 6 treatment sessions, the average flattening increased to 58.13% and average thickness reduced further to 0.213 cm. The flattening of keloids varied from 12 -100% [Figure 1]. Softening was observed in all lesions except an ear lobe keloid. Out of 30, 23 patients (76.67%) attained good to excellent response with flattening ≥50%. Duration and thickness correlated positively with treatment outcome (P value: 0.000 and 0.023, respectively). For analysing the effect of duration on treatment outcome, keloids were divided into 3 groups: Group A: duration less than 3 years; Group B: duration ranging from 3-6 years; Group C: duration more than 6 years. A better percentage flattening of 51% was noted in group A lesions after 3 treatment sessions as compared to 24.5% flattening in group B and 15.8% in group C keloids. At 6 months, the percentage flattening was still highest in group A, i.e., 68.5% vis-a-vis 42.4% in group C. Recent onset keloids had an early response with maximum flattening obtained in first 3 months. In contrast, older keloids with duration more than 3 years showed an initial slow response with maximum flattening being observed in the latter half of therapy [Figure 2]. Similarly for studying the effect of thickness on treatment outcome, keloids were divided into 3 groups again: Group: thickness less than 0.3 cm; Group B: thickness 0.3-0.6 cm; Group C: thickness more than 0.6 cm; with 11, 14, and 5 patients in group a,b, and c respectively. The average flattening observed in groups A and B at 3 and 6 months was almost equal at 32% and 60%, respectively. Keloids with thickness more than 0.6 cm had a relatively po response with average flattening of 37.66%. There was an insignificant negative correlation (P value = 0.253) between percentage flattening at 3 months with baseline thickness. However, there was a significant negative correlation between percentage flattening at 6 months with base-line thickness (P value = 0.023). Thus suggesting, that thickness had an effect on percentage flattening at 6 months but not after 3 treatment sessions. Anatomical site of keloids and aetiology did not have any significant correlation with treatment outcome, either at 3 or at 6 months. A total of 55.56% patients reported improvement in cosmetic appearance. Out of 11 patients complaining of pruritus, 9 were symptomatically better and both the patients complaining of pain were relieved of it. 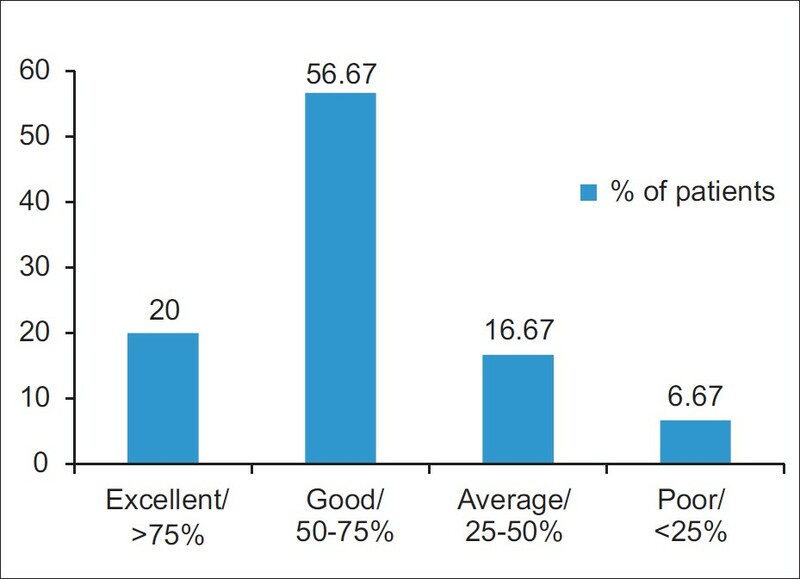 Around 73.3% patients graded the improvement as good to excellent (score 2 or 3 on a scale of 0-3), and 23.3% patients graded the improvement as moderate (score = 1), whereas only 3.3% patients scored the improvement as 0 (mild or no improvement). The commonly noted side-effects were mild to moderate procedural pain and lesional depigmentation. Eight patients had severe pain during treatment, whereas remaining patients had mild to moderate pain. However, the pain was relieved to tolerable level in all patients within 1 hour of therapy. All the patients had lesional dyspigmentation. In our study, it was observed that there was significantly more flattening in younger lesions noted after 3 and 6 treatment sessions [Figure 3]. Lesions less than 3 years duration (Group A) had 51% and 68.5% flattening after 3 and 6 sittings of cryotherapy, respectively. Lesions which were long standing had a relatively lesser response rate. It was also seen that younger lesions had early response with maximum flattening obtained in first 3 months, whereas older keloids with duration more than 3 years showed an initial slow response with maximum flattening being observed in the latter half of therapy. Layton et al. found that keloids with a higher blood flow than the surrounding skin respond better to cryotherapy. He also observed that the more vascular keloids were also of relatively recent onset <12 months duration. Thus again suggesting that recent onset keloids respond better to cryotherapy. Zouboulis and Orfanos  who did cryosurgery in keloids as well as hypertrophic scars also found duration of lesions to correlate significantly with the result of treatment. The therapeutic effect of cryotherapy depends upon freezing-induced ischaemic damage to the microcirculation. Freezing induces vascular damage and circulatory stasis leading to anoxia and eventual necrosis. It is known that early scars are more vascular and this property may be responsible for higher responsiveness of young lesions. 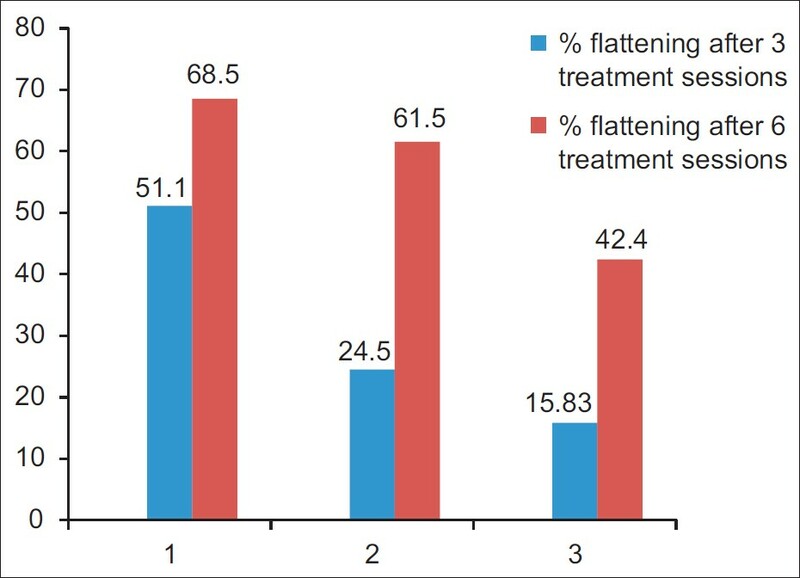 In our study, higher percentage flattening was observed in keloids lesser than 0.6 cm (Groups A and B) thickness after 3 as well as 6 treatment sessions. The thickness did not have statistically significant correlation with percentage flattening after 3 sittings of cryotherapy. But there was a significant negative correlation of thickness and treatment outcome after 6 sessions of cryotherapy. These findings suggest that thickness of lesion is an important determining factor in the final treatment outcome, but not in the rate of flattening. Studies by Sharma et al. and Shepherd and Dawber  also found that smaller lesions had a better treatment outcome. The cryo-spray technique involves freezing of the lesion from the surface, such that freezing to a depth of only 1-2 cm can be achieved. The freezing induced by cryosurgery can be divided into a lethal zone (temperature lower than -22° C) and a recovery zone (temperature in the range -22 to 0° C). In surface cryosurgery, the major part of lethal zone falls on the surface epithelium and not in the deep dermis where major pathology resides. Therefore, the deep abnormal tissue and the critical demarcation line between normal and abnormal tissue may survive freezing as they fall into the recovery zone or unfrozen area. Thus surface cryosurgery in large keloids may not be very successful. In our study, an average flattening of 58.133% was noted 1 month after 6 sittings of cryotherapy; 20% patients had excellent response (flattening ≥75%), whereas 57% patients had good response (flattening 50-75%) and 23% patients had average to poor (<25%) response. Indian study conducted to assess the result of cryotherapy by Sharma et al. found excellent response in 43.3% patients, good result in 26.7% patients, fair and poor result in 16.7% and 13.3%, respectively. A better result in this study could be due to the fact that they included only small lesions with depth less than 0.5 cm and gave freeze-thaw cycle of 30 seconds each. Rusciani et al. also observed complete flattening in 73% cases, most of which were less than 2 years duration. Besides its use alone for keloids; cryotherapy has also been combined with other treatment modalities like intralesional corticosteroids and intralesional 5FU. Since the two therapies act by different mechanisms, the effect is synergistic. Cryotherapy can be used pre-injection to induce tissue oedema and thus facilitate intralesional injections. Some researchers have used this treatment modality post injection as well. An added advantage of combining 5 FU is its side effect of hyperpigmentation, which balances the hypopigmentation induced by cryotherapy, thus giving overall better cosmesis. Our study aimed at studying the various factors which can affect the treatment outcome of cryotherapy in keloids. The factors studied were duration of lesion, aetiology, site and thickness of keloids. We found duration and thickness of the keloids as important factors in determining the treatment outcome with cryotherapy. Site and aetiology did not have any effect on the treatment outcome. Thus, it can be suggested that cryotherapy may be an effective mode of treatment for keloids of recent onset, particularly smaller lesions. As the sample size of the study was small and uncontrolled; therefore, larger, controlled and comparative studies are required for more consolidated results. The study also emphasizes the need for early treatment for keloids as the delay in therapy may make them recalcitrant. 1. Shaffer JJ, Taylor SC, Bolden FC. Keloidal scars: A review with a critical look at therapeutic options. J Am Acad Dermatol 2002;46:S63-97. 2. Maguire HC Jr. Treatment of keloids with triamcinolone acetonide injected intralesionally. JAMA 1965;192:325-6. 3. Lubritz RR. Cryosurgery of benign lesions. Cutis 1975;16:426-32. 4. Alster TS. Improvement of erythematous and hypertrophic scars by the 585-nm flashlamp-pumped pulsed-dye laser. Ann Plast Surg 1994;32:186-90. 5. Cosman B, Crikelair GF, Ju DM, Gaulin JC, Lattes R The surgical treatment of keloids. Plast Reconst Surg 1961;27:335-8. 6. Borok TL, Bray M, Sinclair I, Plafker J, LaBirth L, Rollins C. Role of ionizing irradiation for 393 keloids. Int J Radiat Oncol Biol Phys 1988;15:865-70. 7. Ahn ST, Mustoe TA, Monafo WW. Topical silicone gel: A new treatment for hypertrophic scars. Surgery 1989;106:781-7. 8. Gupta S, Sharma VK. Standard guidelines of care: Keloids and hypertrophic scars. Indian J Dermatol Venereol Leprol 2011;77:94-100. 9. Al-Attar A, Mess S, Thomassen JM, Kauffman CL, Davison SP. Keloid pathogenesis and treatment. Plast Reconstr Surg 2006;117:286-300. 10. Layton AM, Yip J, Cunliffe WJ. A comparison of intralesional triamcinolone and cryosurgery in the treatment of acne keloids. Br J Dermatol 1994;130:498-501. 11. Zouboulis CC, Blume U, Buttner P, Orfanos CE. Outcomes of cryosurgery in keloids and hypertrophic scars. A perspective consecutive trial of case series. Arch Dermatol 1993;129:1146-51. 12. Brown JJ, Bayat A. Genetic susceptibility to raised dermal scarring. Br J Dermatol. 2009;161:8-18. 13. Sharma S, Bhanot A, Kaur A, Dewan SP. Role of liquid nitrogen alone compared with combination of liquid nitrogen and intralesional triamcinolone acetonide in the treatment of small keloids. J Cosmet Dermatol 2007;6:258-61. 14. Shepherd JP, Dawber RP. The response of keloid scars to cryosurgery. Plast Reconstr Surg 1982;70:677-81. 15. Zouboulis CC. Principles of cutaneous cryosurgery: An update. Dermatology 1999;198:111-7. 16. Rusciani L, Rossi G, Bono R. Use of cryotherapy in the treatment of keloids. J Dermatol Surg Oncol 1993;19:529-34. 17. Gupta S, Kumar B. Intralesional cryosurgery using lumbar puncture and/or hypodermic needles for large, bulky, recalcitrant keloids. Int J Dermatol 2001;40:349-53. 18. Zacarian SA, Cryogenesis. The cryolesion and the pathogenesis of cryonecrosis. In: Zacarian SA, editors. Cryosurgery for the skin cancer and cutaneous disorders. 1 st ed. St Louis: The CV Mosby Company; 1985. p. 1-30. 19. Hirshowitz B, Lerner D, Moscana AR. Treatment of keloid scars by combined cryosurgery and intralesional corticosteroids. Aesth Plast Surg 1982;6:153-8. 20. Banfalvi T, Boer A, Remenar E, Oberna F. Treatment of keloids. Orv Hetil 1996;137:1861-4.